"Roxanne Alice Allen and Malinda Jane Brown, Westbrook College, Class o"
Westbrook College student Roxanne Alice Allen, Class of 1978, was a Medical Assistant major and lived in Ginn Hall; Malinda Jane Brown, Class of 1978, was a Nursing major and lived in Ginn Hall, also. 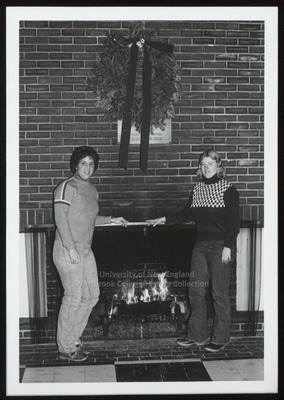 For their senior class candid photo, which appeared in the 1978 Tower Yearbook, they both wore jeans and crew neck sweaters. Roxanne's dark hair was curly and framed her face; Malinda's blonde hair was parted in the middle and brushed her shoulders. They posed at Christmas in Wing Lounge on either side of the fireplace.